Just 30km (20 miles) north from Doha, in Al Khor, the construction process of Al Bayt Stadium switches from enabling works to piling. Over the last half a year it was largely about creating a 14-meter high hill on which the stadium will sit. Now piles are being installed to prepare the ground for foundations and further weight, each going as deep as 21 meters into the soil. Piling is another phase that will consume a lot of time as it’s scheduled to last until the end of 2016! From that point it will take roughly two years to complete the stadium, which is planned for opening in late 2018. The stadium will be shaped like a tent and the large artificial hill rising above its surroundings is an important part of the concept. Traditionally Bedouin tents have been built on raised land to ensure they’re visible to travelers in the desert. In this stadium’s case it will also help to create good atmosphere. Partly sunken into the hill, future seating will have a layout that will improve acoustics, aided additionally by the stadium’s enclosed form. 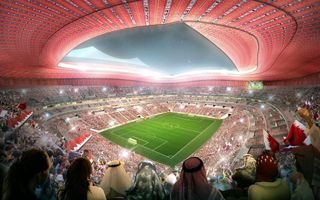 While its distinctively patterned roof will amplify the noise during 2022 World Cup games, the noise might be somewhat lost in legacy mode, as the stadium is downsized to 32,000 seats.